What is an ochazuke? As I explained some years ago , ochazuke is basically rice with various savory bits on it, over which hot green tea is poured. You mix up the rice, tea and bits, and slurp. Ochazuke is often served as the last course in a formal meal, or eaten simply as a quick late-night snack. It’s a great way to use up leftover rice for one thing. 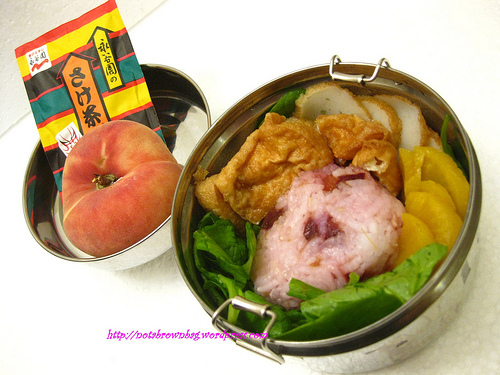 Making part of your bento into an ochazuke is a great idea, especially when the weather turns cooler. All you need is access to some boiling water. You can use an instant ochazuke packet as Mils has done - you can buy them at Japanese grocery stores (general Asian stores may not have them). Or, you can make your own ochazuke. Just pack some rice or other grain (Mils used some pretty cherry colored rice, but plain rice is fine and is what’s usually used), with some homamade furikake  (the salmon flakes  work especially well), or even just a plain umeboshi pickled plum. Make sure that your rice container has enough space in it to add the hot tea, or use a bento box with a built-in bowl like the one we gave away a couple of weeks ago . Add some shredded nori seaweed, crushed rice crackers for crunch and so on, and pack along a green tea bag. Make some tea at lunchtime and pour it over your rice. It may sound weird to pour tea over rice, but it’s really good, I promise. The best tasting ochazuke is a bit salty or sour, and has a mix of textures - crunchy from the rice crackers (the tiny balls you see in commercial ochazuke packets are called arare, and are little rice crackers), nori, and so on. Since rice with bits on its own is not very well rounded nutritionally, Mils has packed the rest of her bento with all kinds of tasty things. Read all about it on her blog .